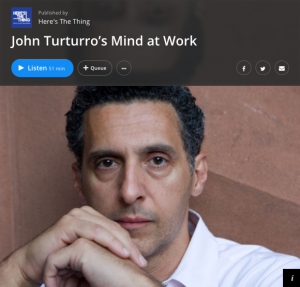 “I had a few teachers who took me under their wing and had a major influence on my life,” said Turturro during the nearly hour-long segment produced by WNYC Studios. When asked by Baldwin to name just one, Turturro did not hesitate. Turturro is one of many well-known guests featured on “Here’s The Thing,” including Patti Smith, Questlove, Sandra Bernhard and Molly Ringwald. “Here’s The Thing” is a series of conversations with artists, policy makers and performers hosted by Alec Baldwin. Each segment focuses on their personal stories, from what decisions changed their careers to what relationships most influenced their work. To listen to the rest of Turturro’s intimate and honest conversation with Baldwin, visit http://www.wnyc.org/story/john-turturro.